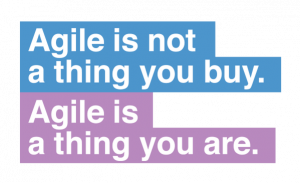 Combining agile and non-agile into a jerry-rigged mishmash misses the point of working in an agile way. Being agile doesn’t mean you give up on governance or deadlines. The idea that agile somehow “needs” a waterfall-type methodology to give it control and governance is nonsense. When you work in an agile way, governance is built into every step of what you do. You build and iterate based on ongoing user research. You build what users need, not what you guessed might be a good idea before you even started building.